Once in a blue moon for the X58? Last month we took a look at Asus' X58 entry, the Rampage II Extreme, and now the world and his canine companion is releasing their own boards for Intel's new wunderchip. The closest to Asus' Republic of Gamers board is MSI's Eclipse, but it seems it is taking a slightly different approach to Asus. All the usual suspects are present: a breakaway Creative daughter board for audio, a seemingly infinite number of USB ports, three-way SLI and CrossFireX support, two gigabit LAN ports and DDR3 support. One major difference between the Asus board and the MSI one is support for 24GB RAM in the latter – the Asus only supports half that amount. In addition to the standard features, MSI has crammed in a couple of innovations. First up is D-LED 2. We've seen a number of motherboards recently which feature indicator LEDs that will highlight whether there's something up with particular components on bootup, but MSI takes it a step further by providing a tiny LED screen with actual words and numbers on it. So rather than getting an incomprehensible series of blinking lights when your RAM isn't seated properly, it will spell it out for you. As well as being useful for diagnosing problems, the D-LED 2 also displays CPU frequency and voltage, plus northbridge voltage. If that's not enough, it's got a temperature detection cable which can be attached to vital components, and will let you know if they're overheating. It's a great idea – diagnosing problems and getting instant feedback from your mobo without having to enter the BIOS is a time-saving winner. MSI has also added GreenPower Genie, which unfortunately doesn't come packed in an oil lamp, but is, instead a small box that sits on the power connector between your PSU and your mobo, and monitors the voltages flowing into your PC. Installing the Windows software allows you to adjust the voltages, and although it's designed for saving power, it will also allow you to overclock to a certain extent. 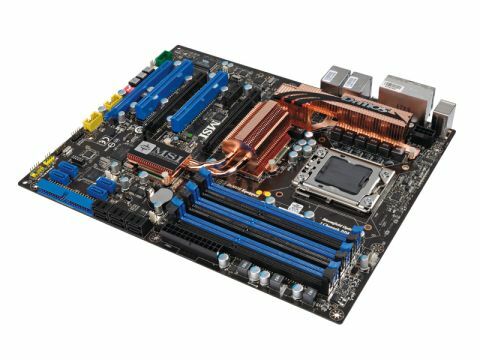 In terms of performance, the differences between the Eclipse and Asus' Rampage II Extreme are negligible – the slightly better processor performance from the MSI Eclipse board is outweighed by slightly worse memory performance. Asus has taken a gaming approach and provides friendlier overclocking features, whereas MSI has gone the green route. The choice, as they say, is yours – but if you're looking for sheer gaming performance, then try following the ROG signs to Asus.